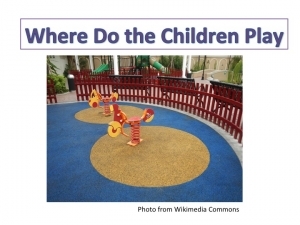 iEARN Projects Space > Where do the Children Play? Teachers and students around the world will explore where and how children play in their communities. Where do the children play and teenagers hang out in your neighborhood or community? Do they have pleasant and peaceful surroundings? Do they have a place to grow, explore, feel confident, and develop their skills in safety? Cat Stevens wrote and performed a song with this name during the turbulent sixties. David Broza sings this still relevant song currently and engages youth in cross-cultural projects. IEARN teachers and students who join our project will explore these questions with photos, videos, and prose. Where possible, they will do community service to improve the places in their community where children and youth play.